Leopoly Web-based 3D modelling tool for 3D printing #3DThursday #3DPrinting « Adafruit Industries – Makers, hackers, artists, designers and engineers! Leopoly Web-based 3D modelling tool for 3D printing, via VoxelFab. 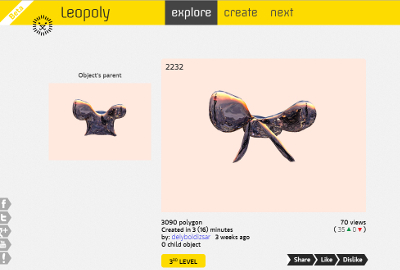 Leopoly is just the kind of 3D modelling and creation tool that 3D printing needs. It is a WebGL browser based 3D modelling tool that lets you push, pull, prod, smooth 3D objects in the browser. Its intuitive and incredibly easy to use. You can grasp it and start creating in minutes. The tool lets you easily make lots of fun organic objects and you can even select from several different materials to render your objects in. You can share things on Twitter and Facebook and remix other people’s objects. …3D printing is an incredible technology but in order for it to be truly useful many people will have to be able to create their own things with 3D printing. 3D printing is a collection of layer by layer manufacturing technologies that all are striving to become the most efficient way to make individual objects according to a (unique) design. Mass manufacturing is better at low cost and throughput. 3D printing is better at quickly letting one make any individual design. Its better at short production runs, items with one user or one use case. In order for the full impact of the technology to be felt many people will have to be able create with it. Now there are approximately 8 million CAD and 3D modelling people worldwide. If we want everyone to be able to make anything they want they will need to be able to design anything they want. The thing holding the market back is not the printers but the software. A book press is useless without writers and literate people. TinkerCAD, 3Dtin and now Leopoly are awesome easy to use tools that will really help 3D printing. By making designing easier they are the gateway to broader 3D printing adoption. Leopoly is in beta and you can ask for an invite here.